With the rain finally arriving in the Bay Area, it is starting to feel like winter, and thanks to the rain and cold we are able to make and cure our annual production of Calabrian sausage , that we typically produce in January when the weather conditions are ideal for curing sausage, cold and humid. In addition to the curing of sausage I love to prepare Friscatula, Calabrian polenta with savoy cabbage, during this time of the year. After spending a couple of weeks in Calabria and Sicily, I am back home. During those weeks I spent 8 days with a fabulous group touring and eating our way through Calabria. We had a great time and enjoyed many luscious meals. Take a look at some of the photos below and the remainder on Cooking with Rosetta Facebook Fan Page. Hi folks, It was time to spruce up my old website. With the help of the talented Kristy Gardner of ohksocialmedia I’ve given the site a complete makeover to make it easier to find everything you need. I hope you will click around and check out some of the new features. Are you wondering what in the world these summer greens called “tenerumi” are? Tenerumi are the leaves and tender shoots of the long squash plant called “cucuzza” found all over Palermo markets. These greens are eaten all over Sicily and also in Calabria where they are known as “taddi di cucuzza”. Here is a picture I took in Palermo’s market last summer, showing the tenerumi next to the long squash. I just got back from New York and I have been busy getting ready for the Christmas Eve Feast dinner. Mom has been frying all day making grispelle, cuddurieddi and cannariculi. If you missed me on the Martha Stewart baking show on Tuesday, click here to watch a clip of the show. Click on the "Peaches with cream" picture to see me making the ""Pesche con crema" with Martha Stewart. It has been a very busy past month with the book signings that has kept me away from the blog. The big news now is that I will be in New York as a guest on The Martha Stewart Show on Tuesday, December 21 at 10 am. Check your local Hallmark Channel for times in your area. I will be demonstrating making the “Pesche”- whimsical little cakes that resemble a peach filled with pastry cream. Here is a picture of the "Pesche" from my cookbook by Sara Remington. I am excited to be in New York this time of the year and enjoy the holiday displays. The culinary tour ended today but I haven't been able to add posts or upload any pictures because of the slow internet connection. Everyone on the trip thought it was a success, and the only complaint from them was that I fed them too much food. We did eat it all, tho', since it was too good to leave on our plates. We all had a wonderful time cooking, foraging for mushroom, visiting various producers, wineries, produce markets, and we even checked out castles and churches along the way. Check out some of the photos below and the remainder on My Calabria Facebook fan page posted in the Calabria culinary tour 2010 folder album. Do you recognize any of these unusual mushrooms? Below are photos of some of the foods we ate during the tour. Today is the day I'm leaving for Calabria. Although my culinary tour starts next Saturday, September 25, I will be there a few days earlier to visit my relatives and recover from jet lag. I will be posting some photos from the tour either here or on the My Calabria Facebook Fan page. Take a look at the itinerary to see what we're doing each day. Gotta run. June 24 is the day when people in Calabria and throughout Italy start the process of making nocino. June 24 happens to be San Giovanni’s day (St John’s day) and tradition has it that the green walnuts must be picked on this day to make the best nocino. Nocino is a dark-colored liqueur with a hint of spice, and is typically served cold. It is considered a digestive in Italy but I like to use it in desserts. I make a walnut cake (the recipe will be in my book) that I serve with a custard sauce flavored with nocino and it is so good! I also drizzle it over ice cream. I have never made nocino; instead I have always brought it back with me from Calabria. The brand I buy is made locally in Scalea and has a 35% alcohol content. I have been talking about making nocino for years but every year I always seem to miss the date of June 24. This year, tho, I remembered. I called my friend Laura, who happens to have a huge walnut tree on her farm, and asked her if she could pick two dozen green walnuts on June 24 for me. She brought me 27 walnuts and I used them all, even though I heard once in Calabria that you must use exactly 24 walnuts as it is June 24. I don’t think a couple of extra walnuts will ruin it. I was trained as a scientist, so I figure that the more surface area there is, the more I can extract, right? Or should I be a good Calabrian girl and follow the traditional ritual? If you are interested in making nocino I am sure that you can still make it in the next couple of days if you can find some green walnuts. If not, you can wait until next June 24 or if you just want to try the liqueur, you can buy nocino made by Monteverdi Spirits of Napa, California. some spices, and a bottle of Everclear grain alcohol, 151 proof. I guess you could use vodka but in Italy it is made with grain alcohol and I have always used Everclear to make my limoncello so I decided to do the same for nocino. You need to cut the walnuts in half lengthwise, and then quarter each half. You will end up with eight pieces. Make sure you wear gloves and use a plastic cutting board; the juice of the walnuts will stain your hands as well as the cutting board. Place the cut walnut pieces with the alcohol and the spices in a canning jar with a rubber gasket and clamp lid, or any other jar with a tight-fitting lid. Cover and leave the jar on a window sill for the next 40 days. Make sure that the walnuts are covered by the alcohol. I didn't have quite the right size -- my jar is a little too big but it will do. After 40 days, the liquid looks dark brown in color. Filter the dark colored alcohol from the walnuts and spices and add a cool simple syrup (3 cups sugar dissolved in 1 liter water) to the filtered alcohol. Put it away for 40 days in a cool place. After 40 days it is ready to be bottled and stored in a cool place. The homemade nocino was as good, if not better than the one I brought back from Calabria. Cut the green walnuts in quarters lengthwise, and then cut each quarter in half. You will end up with eight pieces per walnut. Place the cut walnut pieces with the alcohol and the lemon zest, cinnamon, cloves and vanilla bean in a canning jar with a rubber gasket and clamp-type lid, or any other jar with a tight-fitting lid. Cover and leave the jar on a window sill for the next 40 days. Make sure that the walnuts are covered by the alcohol. After 40 days, the liquid should look dark brown in color. After this time, make a simple syrup by placing 4 cups of water and 3 cups of sugar in a pan over a low flame and heat until the sugar is dissolved. When the sugar is dissolved, remove it from the heat and let it cool to room temperature. Make sure that the sugar mixture is completely cooled before adding it to the infused alcohol or the liquer will become cloudy. Filter the alcohol from the green walnuts and spices and add the cool simple syrup to it. Then put it away in a cool place for another 40 days. After 40 days, you can bottle it and store it. It will be perfect for Christmas! Calabria is famous for its sweet red onions named after the glamorous beach town of Tropea. During the month of May and June you can buy them freshly harvested at roadside farm stands. Later, in June and July, they are sold at markets strung in a ristra. In Calabria these red onions are eaten raw in salads; cooked in sauces; roasted or grilled; placed on top of pizza or in frittate; made into jam, and even added to ice cream! Last year when I was in Calabria in May, right when they were being sold as young fresh red onions, I enjoyed them roasted under salt at Casa Janca in Pizzo. I never had them prepared this way and it was the most wonderful side dish of the evening. Signora Rita Callipo roasted them under a crust of salt and then served them with only a drizzle of extra virgin olive oil. I could have made an entire meal out of them. They were so good that when I got back home I pulled some young red onions from my garden and prepared them the same way. I just made them again last night and decided to share this simple recipe with you. If you have never cooked under salt don't be afraid of the quantity required. The salt seals the food and keeps it moist, yet it doesn't get into the food. I roast whole fish under salt and it is truly the best way to prepare it. You can get my recipe for seabass under a crust of salt in my cookbook due out this fall. Clean the fresh red onions by removing their roots and stems. Mix 1.5 lbs of Diamond Crystal Kosher salt (a half box) with enough water (about 1 cup) to make it the consistency of sand. Use only Diamond Crystal kosher salt; other brands are made by a different process, so the crystals have a different shape and are less absorbent. Place a piece of parchment paper on a cookie sheet, which will make cleaning easier, and make a bed of salt. Lay the onions on top and cover them with the wet salt. Pat the salt down and make sure that no part of the onion is exposed. Bake at 400 degrees for 30 minutes. Crack the salt crust. Remove the onions and clean any salt that sticks to them. I also remove the outer layer of the onion. Cut the onions in half and drizzle with extra virgin olive oil. Sprinkle with a little sea salt if needed. Give it a try. They are so good! My parents used to raise a hog in Calabria every year and right after New Year's Day we would all get ready for the Annual Whole Hog Ritual. We don’t raise a pig in California, of course, but we still maintain the tradition of making our own salumi the old-fashioned way. When it gets cold here in the Bay Area and it is drizzling we buy lots of pork meat and make salsiccia, sopressata, capocollo, pancetta and prosciutto. This year we made our first batch right after Christmas and we started eating the cured sausage this past week, since it takes around three to four weeks to cure. There is nothing like the taste of homemade salumi! It is actually very easy to make fresh homemade sausage. But the making of cured sausage I leave to my father, the expert salumiere, who knows what he's doing. Calabrians who make their own salumi at home use only salt and the perfect weather conditions to cure them. But all commercially-made sausage is required by government agencies to add preservatives and nitrates. We season the ground meat with only the following ingredients: salt, wild fennel seeds, and pepe rosso dolce (sweet Calabrian paprika). We add peperoncino macinato (hot pepper powder) to some for the spicy version. Nothing else goes into the meat. The meat is mixed until it is a beautiful red color. My grandmother used to say that it wasn’t mixed well until your hands were colored red from the paprika. The meat is then stuffed into natural hog casings using my mom's old fashioned sausage stuffer. But back in Calabria she and her mother would spend the entire day stuffing casings with a funnel and their thumbs! We still have to make sopressata, but at least we are all done making this year's sweet and spicy sausage, pancetta and capocolli. That prosciutto in the photo above was made last year. Since we still have some left, we are skipping making prosciutto and instead we may make more capocolli. December is the month for desserts in Calabria. Every year the season starts on December 13 with the festa di Santa Lucia. This is the day that many cooks start the fritture, the annual frying of yeasted dough for desserts. In some towns people prepare la cuccia, which is cooked wheat berries with nuts, mosto cotto and spices. In the area of Calabria in which I grew up, Christmas meant grispelle, yeasted dough-and-potato fritters, shaped long and drizzled with honey, and cuddureddi, which are ring-shaped and served plain or with honey. Up in the Sila area, especially in the town of San Giovanni in Fiore, you find the traditional pitta ‘mpigliata, baked pastry rosettes filled with walnuts, almonds, raisins, cinnamon, cloves and drizzled with honey. Another Christmas dessert found in the Cosenza area are the scaliddi or scalille, meaning "little ladders". These are fritters made with a sweet dough, but shaped either to resemble a ladder, with two long parallel sides and shorter cross bars, or a long spiral made by wrapping a rope of dough around the handle of a wooden spoon and then dipping the spoon into hot oil. The cicirata is the same dough but cut in the size of a chick pea and fried and coated with honey. Those of you who are Neapolitan know them as struffoli. In some towns the cannariculi are coated with mosto cotto. They are also known as turdilli or crustoli. The chinule are shaped like a ravioli or half-moon turnover and filled with a puree of chestnuts, raisins, chocolate, cocoa powder and spices and then are fried and drizzled with honey. As you go further south in the boot you will find many other types of traditional desserts at Christmas time, like petrali, half-moon shaped cookie dough filled with dried figs, nuts, chocolate, mosto cotto and cinnamon, and then baked and covered with a glaze. And there's the pignolata, tiny fritters covered with either a chocolate or lemon glaze. I know that you are all waiting for the recipes for these desserts but unfortunately I can’t include them this year--all the ones that I mentioned are in my upcoming cookbook, and I am not allowed to give them out. But I promise you that I will give them to you next Christmas! All the photos in this post were taken by Sara Remington for my book. I will add more pictures to the blog as I begin my own fritture. When I lived in Calabria as a child I was surrounded by fig trees all around our farm, and I never could decide which type to pick from first. 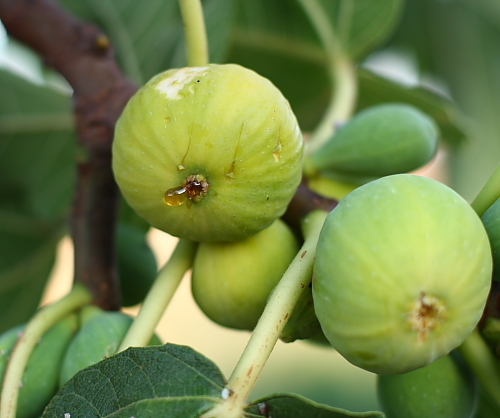 The best fig that is grown in Calabria is the "dottato" variety, known in this country as the "kadota" fig. These have a green skin with a golden interior. They are excellent fresh as well as great for drying, which is what my grandparents used to do with them. When I moved to California as a teenager, my dad planted some cuttings from our friends' trees. Then, when my husband and I built our house in the Oakland hills, the first thing we planted were two fig trees. One was a black mission and the other was one that my dad grafted into two varieties, the "kadota" and the "adriatic". Kadota Figs. Note the drop of honey on the blossom end of the center fig. Perfection! I have been picking my first crop of the Adriatic variety for the past two weeks. The black mission figs are just starting to ripen this week. My favorite way to eat them is right off the tree, fully ripe. Most figs sold at the store are underripe, so try to go to a farmers' market to buy them. A ripe fig is soft to the touch; you should see some cracks in the skin. If you see that little tear of syrup falling from the blossom end you have a perfectly sweet fig. Calabrians don't really cook with figs unless they are making jam or using them in a dessert. As for savory dishes, I will wrap some prosciutto around a cut fig, or slice them in a salad of arugula with some prosciutto. The majority of the figs grown in Calabria are dried in the sun and are nowadays packaged in beautiful confectioneries. My grandmother would braid the dried figs in various shapes: coroncine (wreaths) around stems of fragrant myrtle; spinapisci (fish spines) in which dried figs are threaded around a sharpened reed in the shape of a fish spine, one fig to the left and one to the right; and crocette (crosses), in which two figs are split and stuffed with pieces of walnut or an almond and crossed in the form an "x". These are then all baked. There are two firms in Calabria around Belmonte Calabro and Amantea that do a beautiful job packaging dried figs: Colavolpe and Fratelli Marano. They shape them in the traditional forms, but also stuff them with almonds and a piece of candied orange peel, dipping them in dark chocolate, my favorite way to eat them dried. What is all the talk about ‘Nduja? In the last month I've read many articles about 'nduja. I am happy to see that people are finally discovering it. 'Nduja is a fiery, spreadable sausage of smoked pork that is unique to Calabria. The most famous is 'Nduja di Spilinga, which gets it name from the town in Vibo Valentia that has the largest production of this delicacy. It is now also produced by salumifici (salumi factories) in other areas of Calabria, but the people of Spilinga and all around the Monte Poro area will argue that their 'nduja is special. Why? Because the ingredients include the sweet and hot peppers grown only in the area. 'Nduja is prepared with the parts of the pig that will produce 40 to 50% fat. The meat is ground very fine and then all that is added is salt, ground sweet pepper and ground hot pepper. It is well mixed and stuffed inside a natural hog casing of the large intestine. It is smoked for about a week and then dried for three weeks or longer, depending on the size of the casing. It is one the most famous foods Calabria has to offer and can't be purchased as yet in this country. Boccalone has started selling its own 'nduja as of last month. It is different from 'nduja from Calabria. It resembles the French rillette, with the texture of a pâté, and has a lot more ingredients, like orange peel, wine, sugar, and vinegar. In contrast, Calabrian 'nduja has only pork, sweet pepper, hot pepper, and salt. Simple but heavenly! Also, the Calabrian 'nduja is coarser in texture, more intense in pepper flavor, and tastes much smokier. So how do you eat it? I enjoy it just spread on bread or on a plate of fusilli (homemade pasta shaped around a knitting needle). 'Nduja is wonderful on top of pizza, added to beans and soups, or inside a pitta (the stuffedCalabrian pizza). If you want to try Calabrian 'nduja in America you can come to my cooking class in September, when we will toss it with homemade pasta. You can also join me this fall in my culinary tour to Calabria; we will use 'nduja in one of the cooking class held right in the area whereitis made. Here are lupini, a soft bean that Calabrians often eat as a snack. My friend Fanny says they are very popular in the ethnic neighborhood feste in Chicago. They also sell cured salumi and pecorino cheese in the market, all of which are homemade. In the photo below, there are (left to right) capocolli, soppressate and salsiccie calabrese. I'm here in Calabria with photographer Sara Remington (go here for her pictures) doing a photoshoot for my upcoming cookbook, My Calabria. La Riviera dei Cedri, the "citron coast", is on the Tyrrhenian side of Calabria, stretching from Praia a Mare to Cetraro. It is known for the cultivation of cedro, or citron; this is also the area of Calabria where I was born. Below are some of my own pictures to show you the beauty of this area through my eyes. A quaint and interesting doorknob in Scalea; anyone have a guess as to what animal is portrayed? I'll be posting more as we keep travelling through Calabria.